The weather has turned cold again with temperatures down to -6C at night and barely rising above zero during the days; well it is the shortest day with the sun setting at 15.25. 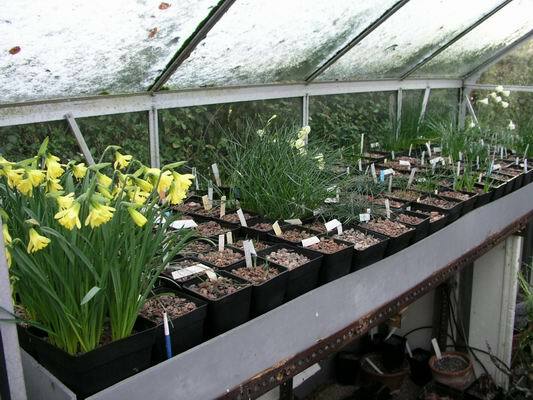 The bulb houses are all shut up, but, if the sun comes out at all during the day I open the doors. 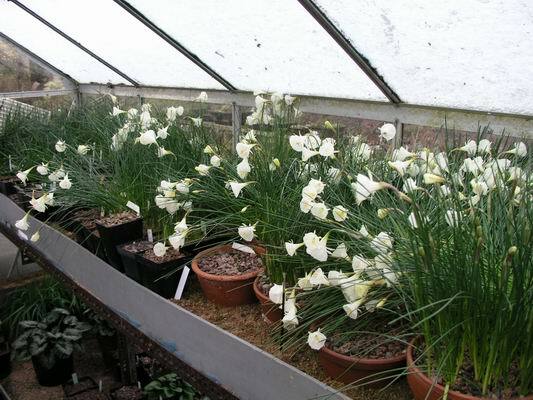 There is nothing worse for the bulbs than a sudden rise from these freezing temperatures; and with such small glasshouses this can happen surprisingly quickly. 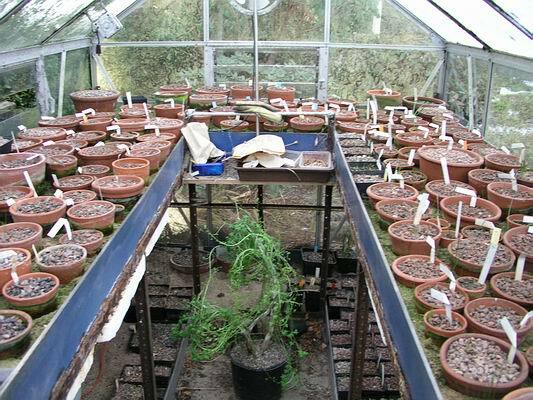 Not all the pots have the benefit of the soil warming cables and some have become frozen. 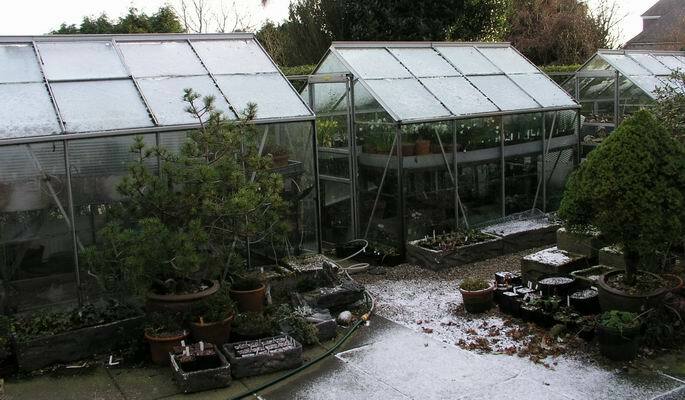 They will not be frozen solid all the way through to the bulb but they are frozen sufficiently to stop any moisture movement within the plant that is why they flop over in this alarming way. 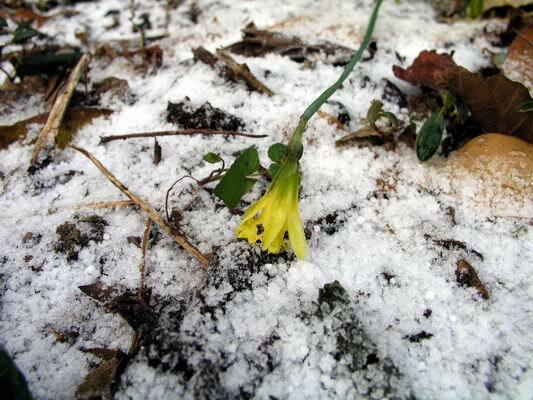 The narcissus will survive but it will be interesting to see how the supposedly not hardy Lachenalia survives these conditions. A quick look around the glass houses shows that there is nothing showing in the frit house yet, just a Tropaeolum tricolorum on the floor. 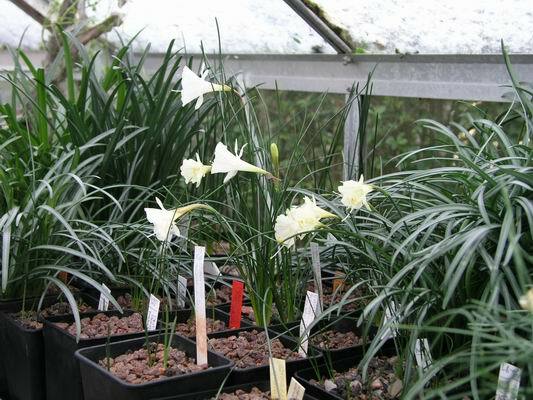 In what was our propagation house, before the bulb invasion, there are several forms of Narcissus flowering. 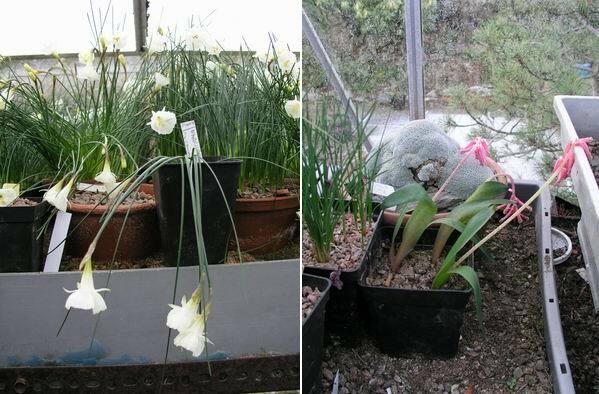 It is in the bulb house that there is the most flowering interest with Narcissus romieuxii forms and hybrids dominating the picture. On the other side there are mostly Crocus which are in a quiet phase just now but Narcissus 'Cedric Morris' is looking very good and cheerful for midwinter. Thought to be a giant form of N asturiensis this bulb is nearly always out at this time of year. It has never set seed for us but it does increase quite well by division of the bulb. I have on occasion, breaking my own rules, planted a few of these bulbs not deep enough in the pot. My reason for doing this is that when planted too shallowly the bulbs often break down into many small, non-flowering sized bulbs, especially if you also keep them on the dry side. 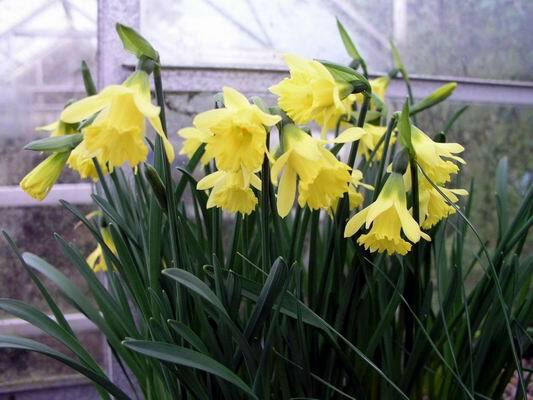 As a result of this mistreatment to a fat bulb, I can get 10 or more small bulbs which after another year or two will reach flowering size - another way to increase stocks. The Cedric Morris in the garden are not looking so happy. Firstly they have etiolated stems due to them having had to compete with a self seeded Primula whose leaves had covered the bulbs completely plus they are well frozen just now. Do not worry they will perk up when the frost goes. 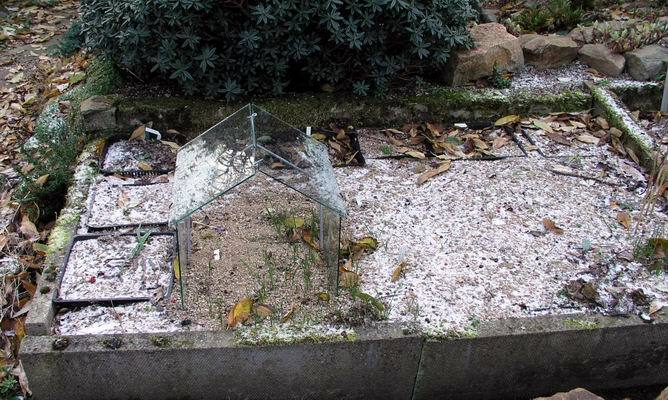 The sand plunge has just a few Crocus leaves showing but it is interesting to note how the simple glass barn cloche keeps some of the frost off. The cloche has been there since the Crocus banaticus were in flower and I cover them in this way, when the flowers are out, as I have discovered that this encourages a better seed crop. 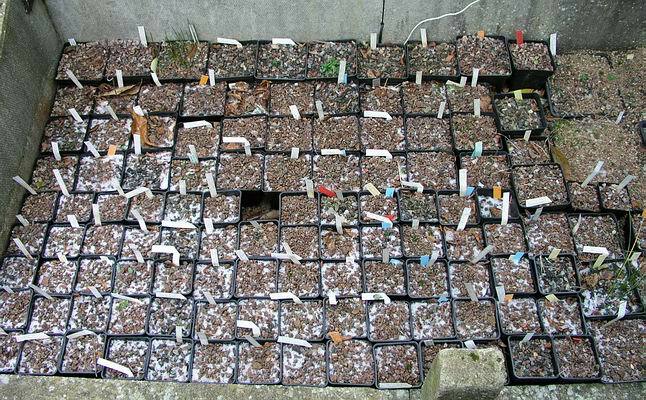 The bulb frames are not covered but, if the cold turns to wet, I will cover them as the wet can do more harm than the cold in our stop/start winters. In one of the open seed frames Fritillaria pluriflora is always among the first to germinate. 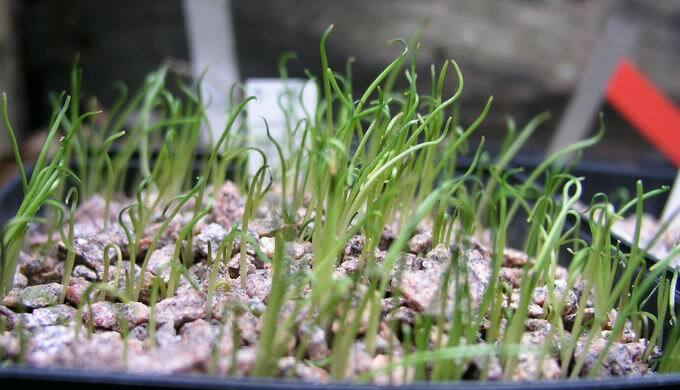 These seedlings are frozen solid as I did not notice them until a friend told me he that his F. pluriflora seed was germinating , so I went to check them- they will have to stay there until they defrost. 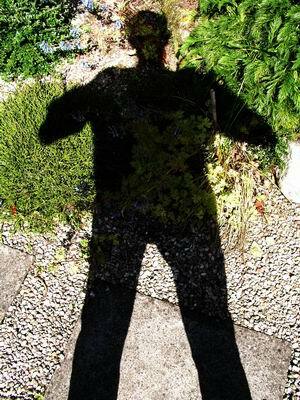 It is a fact that there are a whole series of 'micro climates' in even a small garden -among the factors that create these differences are the planting of trees and shrubs. You can see how much more frosty one area is when compared to another. 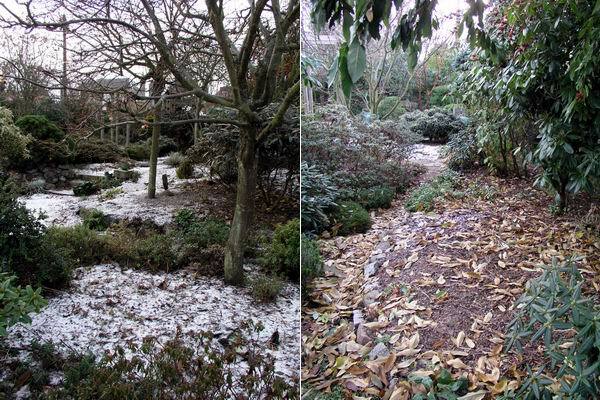 The frost has penetrated much more deeply on the left while the thicker tree cover on the right has moderated the cold effect. I want to thank everyone who has taken the time to respond to my question of the Bulb Log continuing through 2005. As well as the forum and guestbook posts I have received emails, cards, phone calls and personal requests urging me to continue - with that level of support, how could I stop? If you still have not signed the guest book please take a minute and leave a message of support to the WebTeam, who appreciate your comments. This is Log 52 for 2004 and the Log will continue in 2005. I have a few ideas in mind to make it slightly different and will also address the need for it to advance in detail but still be useful to the newcomer. My worry about it becoming repetitive does not seem to be an issue with most of you and I suppose that the very nature of growing bulbs is cyclical so the same issues and plants will continue to arise. The 2003/04 logs will still be available on line to refer back ,to with a third column, for 2005, being added to the index page. A big thank you to Fred Carrie, the techno whiz kid who handles all the technical stuff that gets my log (and all the rest of the SRGC site) to your screens.